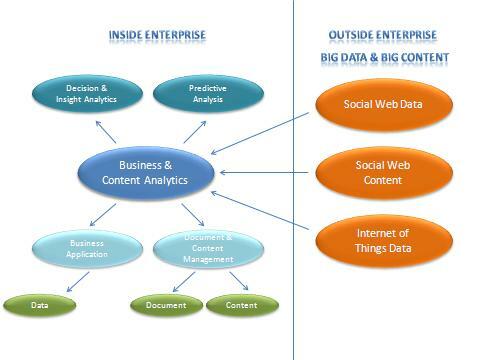 With “Analytics 2012” The Innovation Group offers for the first time to look at and analyze these two great strategic themes in an integrated way. Businesses’ and Organizations’ competition will be based in the future not only on efficient management of transactional operational processes, but on the ability to manage information and content intensive processes in a new and integrated way. The Big Data revolution exploded with the widespread and frequent use of social networks and the diffusion of IoT (Internet of Things) technologies allow companies to achieve for the first time a strategic and integrated vision of Business Analytics’ potential, applicable to structured data with those of Content Analytics, applied to non-structured content management from Document Management, internal and external to the organization, to digital content from the web. The future of Analytics applications will therefore be directed towards integration and merging of Business & Content Analytics; this represents possibility to search and analyze not only historical data, information and content, but also the Live Data, generated in real time inside and out of the company. Furthermore Business Aanalytics technologies allow for advanced visualization techniques that ease the injection of intelligence and predictive knowledge in the decision making and operational processes through real time interaction and feedback as events occur. In parallel the new Analytics Applications help develop and feed the process of consumerization of business intelligence and democratization of the company’s data and content that are made available and delivered easier through the use of mobile devices and the company’s cloud services. This opens the way, internally to a progressive disintermediation of Middle Management that took care of elaborating data to prepare them for Top-Management decision-making processes and externally to a radical transformation of the traditional ecosystem of Market Research.